Truly a Rite of Spring! Have you been checking out the gardening stores and sections of hardware stores with all the plant startings and seeds. Well, I planted mine. I have containers with Cherry Tomatoes, several tomato plants, plenty of peppers and lots of herbs started. Of course, it is a bit early to harvest anything, but everything is planted and nicely growing. I even have a couple of cherry tomatoes that should be ripe in a week or so. It's a big pot of lettuce and assorted mixed greens (red leave, and peppery arugula among others). All ready grown and ready to be harvested. It also serves double duty as a center piece for our outdoor table (we eat and serve a lot outside). It is a very simple matter to take a bread knife, saw off a few leaves (be sure to leave about two inches of stalk so that it grows back). This one bowl will provide about a dozen salads every two weeks. It regrows FAST! And instant salad! Now, shortly I will have tomatoes and peppers and herbs to add to the mix to make something glorious. But after a winter of vegetables and greens coming from thousands of miles away, it is a real treat to make a few cuts, wash a few leaves and sit in the sunshine and plot... How I am going to spend my summer vacation... Basking in the actual fruits (well, vegetables) of my garden. As I am sure you have heard, eRecipeCards.com and the friend to bloggers everywhere, O OLIVE OIL are putting on a HUGE cooking contest. I have looked through several of your ideas and they sound simply spectacular. Top quality Artisan ingredients with extra spices and loaded with cooking skills you all are famous for. On advice from the good folks at O Olive Oil (if you read their website carefully, they have some wonderful uses for their products already posted), I have started using the oils and vinegars as finishing sauces. Simple fresh ingredients paired with a fresh made vinaigrette. I am drooling at the idea of picking a tomato and just a spritz or sprinkle of Tahitian Lime oil and a bit of salt... What could be better? I lined my bottles up in front of my tomato and pepper plants to give them a little encouragement to get started already! A Home made Vinaigrette is so easy to make. 3 to 1 mix of Olive Oil and Vinegar whisked together. Add some spices or herbs if you like. Even some fresh juice if you want to flavor your dressing. 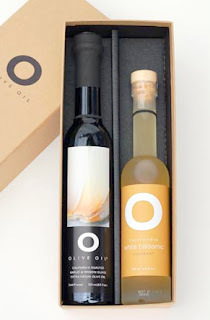 O Olive Oil offers a wonderful "deal" on collections of their products, including a "Signature Series" Collection of a couple of bottles of Oil and even more vinegars. That collection just happens to be one of the $1,000 in prizes awarded for the contest. It is also a wonderful way to spend your summer vacation... Pick a little lettuce, mix and match your pressed flavored Oils and Vinegars And you have a fresh summer treat! My single serve salad (Jackie is still off to her inconvenient day job) is a handful of lettuce, 1 1/2 teaspoons of Tahitian Lime Pressed Oil whisked together with 1/2 a tsp of Champagne Vinegar. Can't wait to see what I mix up tomorrow! eRecipeCards and the friend to bloggers everywhere, O OLIVE OIL are sponsering a cooking contest among bloggers... 24 bloggers will be selected to receive FREE pressed oils and gourmet barrel aged vinegars to work blogger magic. Over $1,000 in products will be awarded and we want YOU to be a part... Click HERE for all the details! Sweet Potato Chips with Flavored Vinegar!!! I have a new passion in my life... Sweet Potato chips. Very easy to make, grab a handy mandolin to slice the potatoes thin, heat oil (canola or peanut oil for it's high burn temperature). Fry to just when the chips start to darken. This way they have a bit of the softness of a cooked sweet potato, but also the snappy crispness of a store bought bagged potato chip. Drain on a paper towel and enjoy! But to really set these apart, I like to spritz them with a bit of flavored Vinegars! You've seen those little oil spritzers. Very handy for dieters controlling the amount of calories added to a salad. But also VERY useful for infusing just a bit of extra flavor to the sweet potato chips. and even 3 different rice Asian inspired vinegars. The comforting aroma and rich taste of ripe Sonoma apples drenched in late harvest honey. Sparkling apple cider and the purity of honey create timeless flavors of health and wonder. Round and sweet with just the right tartness. IMO... A perfect pairing for the chips! And, by using a spritzer, a little goes a long way, making this a very affordable option for a healthy tasty crispy treat! With of course these O Olive Oil, Honey and Vinegar spritzed sweet potato chips and you have the perfect weeknight meal! Olive Oil, We all use it, we all could use more AND we all would like a chance to try a premium gourmet oil for FREE! O Olive Oils are different and better than the run of the mill. Pressed replaces infused for a deeper, richer taste; perfect for salads, raw vegetables and light sauteed dishes... You know, the foods we have been waiting for all winter! With a combined prize pool of over $1000, you will want to be a part of the contest and the FUN! 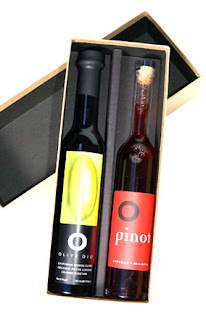 O OLIVE OIL is the premier producer of California specialty olive oils and wine vinegars O was the first in this country to crush organic citrus with olives to produce our signature line of oils. Additionally, we travel the world to source the finest extra virgin olive oils. Our products are sold in gourmet, natural food and specialty stores in the United States, Canada, Japan and Europe, and Latin America. 1n 1995 Greg Hinson, co- founder and president, combined his unusual passion for citrus and healthy eating bycrushing whole organic citrus with fresh California Mission olives to create an unparalleled new product category—the extra virgin citrus olive oil. These oils are neither infused nor flavored after pressing as is common in the industry. And if you visit their "Media Page", you will see reviews from Bon Appetit, Cook's Illustrated, New York Times, Town & Country and many more! The best known "O" loves them too! Oprah calls them “terrific wines and vinegars” and has featured them on both her show and in her magazine. O products have fast become a favorite of home cooks and professional chefs alike. The food industry agrees. O Olive Oil has been recognized with 10 awards at the annual International Fancy Food Show in New York City. 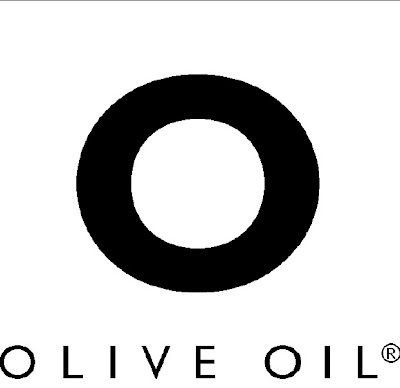 Watch for O Olive Oil on classic episodes on The Food Network, Iron Chef, Naked Chef, ABC Good Morning America & Top Chef. And they have even been shown recently on Modern Family!!! And now... The contest rules! 1... You must be registered and be a submitter at eRecipeCards.com. Registering is easy (all you need is an email address and a food blog). If you do not have an account yet, go ahead and register. Go ahead and look around and submit at least one recipe to the site (more if you like). There is a very easy, step by step guide to getting started that you can see by clicking HERE. 2... You must have a FaceBook account and you must "LIKE" both eRecipeCards and O Olive Oil. Again, setting up an account is easy. If you do not have an account and are unwilling to set up an account at this time, please drop me an email at the address at the top of this blog. Drop me a comment on this blog once you "Like" us and that you "Like O Olive Oil. Click http://www.facebook.com/pages/eRecipeCardscom/115234838571713 to "Like" eRecipeCards.com (and BTW, we will "Like" you back! 3... Next, you will be asked to visit the "Gifts" page and then view the "Natural Box" items. 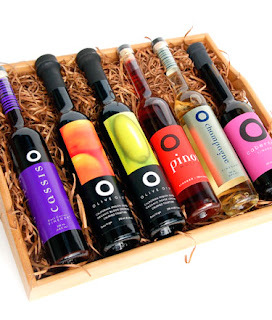 O Olive Oil has paired a pressed flavored oil with a premium gourmet vinegar. In fact, they have paired 8 different pressed citrus oils with one of their best gourmet California vinegar (Like the Meyer Lemon pressed Olive Oil paired with the Pinot Noir red wine Vinegar shown in the photo to the right). These 8 box sets will be shipped to 24 selected cooks/bloggers (one set per blogger). Each set has a $30 value. These are the products you will use to make the dish you submit for the contest. But first, you will need to be selected as one of the lucky cooks. Each potential cook should look over the 8 options and get inspired (from Garlic pressed Oil paired with White Balsamic Vinegar to Zinfindel Vinegar paired with Clementine pressed Oil the "Natural Box" page certainly has something to inspire you). based on a random drawing and based on a submitted idea. We will also select recipients based on a submitted idea. These cooks will be judged on the understanding of the product. HINT: these are tasting oils/vinegars, not really meant for cooking and certainly not for frying. Best ideas will be salads and vegetable dishes that show off the unique aspects of the oils as finishing a dish. The O Olive Oil website features an "about the CRUSH" page that gives the story of why these are special and what the differences are from the ordinary. Plus if you check out the individual products page they give ideas for how best to use each individual bottle. A glance through their website will give you plenty of inspiring ideas of how to adapt a favorite recipe of yours with their products. Just email me an idea. You can select more than one pairing idea, no need to send separate emails. "Winners" will be chosen based on the idea and how well it matches the product, not the number of submissions. We will pick the best. Except, sadly, due to shipping costs, the contest must be limited to bloggers living in the US and CANADA only. However I do have an idea for a way International bloggers can be a part of the fun. Drop me an email if you would like to participate but live outside of Canada or the US. And that's it for this stage... Just be a submitting member of eRecipeCards.com, "Like" eRecipeCards.com and O Olive Oil, AND be inspired. Once we have our 24 finalists, they will win a pairing of gourmet pressed citrus O Olive Oil with a premium Vinegar to use for the contest. The actual contest will start with these 8 winners. One Winner will be awarded a prize based on their photo and food stylings skills (Valued at $50). One Winner will also be awarded a prize based on their writing skills (Valued at $50). EIGHT Additional winners will be awarded a "second Place" prize of a new bottle of vinegar AND Oil from the Charcoal collection. And finally 14 winners will be selected to win a "Third Place prize of a jar of O Olive Oils new line of citrus Tapenades ($10 value)! And of course, we are a recipe portal. So a GRAND Prize (Valued at ONE HUNDRED and FIFTY DOLLARS) will be awarded based on the "best" recipe. So, in addition to the initial oil/vinegar combinations provided for the contest, every entrant will receive an additional prize ranging in value from $10 to $150! And of course, please drop me a note if you have any questions. We worked hard on this promotion. I feel it rewards our sponsor, while at the same time provides bloggers access to a premium product not always on their shopping list. If you have any suggestions for ways to improve future contests, please drop me a note. OK, First, go ahead and hot play here... Be sure to watch after the first 45 seconds... It takes a weird turn. It's Springtime and for a few days, highs in the 80's, it felt like SUMMERTIME! Here's a wonderful fresh crisp salad I whipped together for Easter dinner. And to add to the fresh springtime taste, I made a wonderful GARLICKY Vinaigrette that I drizzled over the top. That friend to all bloggers, O OLIVE OIL recently sent me a delightful collection of some of their premium artisan PRESSED Oils and Artisanal Hand crafted Vinegars in preparation for a HUGE contest (come back on Monday, April 16 for details; But 24 lucky bloggers will get a chance to test these gastronomic delights themselves). I chose to add garlic to garlic with a 3 to 1 mix of O Olive Oil's newest creation, 3 parts of a cold pressed garlic Olive Oil added to 1 part of the most amazing White Balsamic Vinegar. Combined with my 30 pieces of Garlic Grilled London Broil, this was a great introduction to my spring grilling season. Beautiful presentation with the sliced steak resting on the bed of vegetables. 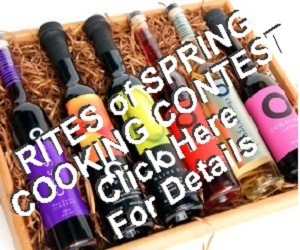 This year's contest will feature over $1,000 in FREE bundles of O Olive Oil's products, and prizes going to the best "Freshness of Spring" use. So start pondering now how to use the most delightful pressed oils and artisanal vinegars to make the springtime the best time to ... THINK FRESH! WELCOME SPRING! and come back on Monday for the details! Here's my Easter Dinner. Big pile of a delicious warm potato/green Bean Salad bed under an INCREDIBLE grilled Top Round roast. I'll do the salad post recipe tomorrow. Today it's all about this delicious meat! LOTS of garlic. I took 10 pieces of garlic and sliced them into thin thirds. That's thirty pieces of garlic! I embedded these into the roast. Just take a knife that is about the same size as the garlic pieces. Poke deep enough so that the entire garlic piece will sit inside the meat. If you are not a fan of garlic, these are large enough to pick out as you cut the finished slices. BUT, the garlic roasted along with the meat juices makes for an incredible taste. Mix this all together and then rub the meat. NOTE: This is a rub, not a sprinkle. Bub this into the mustard, Pay particular attention to the holes that the you made with the garlic. This forms a bark, which helps to hold in all the juices that might have leaked out during the slow roasting grilling. Allow the meat to rest and come to close to room temperature before you begin cooking. About an hour. This also helps to allow the spices and especially the salt to help absorb all of those flavors of the rub and mustard to absorb into the top layer of the meat. I cooked this on my grill, indirect heat, low and slow ( Almost like smoking on a grill, Coals or burners on each side of the meat turned to low. Burners or coals directly under the meat off (or clear of coals). The internal temperature close to the meat was about 280 degrees. I used an internal temperature prob (Don't cook without one). Cooked the meat (no need to turn, as you are using your grill like an oven with no direct heat applied to the bottom of the meat) until I got a medium rare temperature of 135 degrees. It took about 30-40 minutes. I then wrapped the meat in aluminum foil and let it rest for 30 minutes. the temperature actually evened out at 140 during the wrap rest. this allows the juices to absorb into the meat and have an even temperature throughout the slices. I am lucky enough to see several hundred food blogger posts in a day. Somethings look stunningly beautiful. For me, this was delicious and I was able to capture the right look where I practically can taste this from the photo. Warm enough to enjoy a meal outside on our patio! Grab a beer and enjoy!